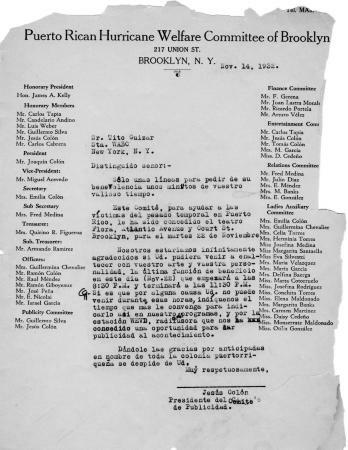 Letter from Puerto Rican Hurricane Welfare Committee of Brooklyn to Jesús Colón extends an invitation to a fundraising event at the Flora Theater, Brooklyn, NY, November 14, 1932. Source: Centro de Estudios Puertorriquen?os.Jesús Colón Papers, 1901-1974. Box 18, Folder 4.